North Carolina's Twisted Tower Dire, for those unfamiliar with the band, formed in Virginia in the mid-1990s in response to the extremely anti-metal attitudes that infested the music industry at the time. We all know the story of heavy metal's retreat into the underground of American popular culture, so it makes little sense to reopen those wounds. Yet, while many bands faded from the scene, Twisted Tower Dire sought to take the industry head on with their brand of traditionally-inspired metal mayhem and wave the flag of true metal squarely in the face of the grunge movement. Now, seventeen years later, having overcome multiple line-up changes and the tragic death of their original singer, the band remains as committed as ever to carrying on the standard defined by the legends of old such as Judas Priest, Saxon, and of course Black Sabbath. Though only the band's fifth studio full-length and with a five-year gap between it and its predecessor, Make It Dark is nevertheless a worthy addition to Twisted Tower Dire's retro-lutionary catalog. The most significant question that TTD fans may have regarding Make It Dark is what impact does new frontman Jonny Aune have on the band's sound. Tony Taylor was, after all, a formidable classic metal singer. As crucial to TTD's sound as Taylor was, I feel that Aune takes the band's punch up a couple of notches with a style that is wider-ranging and significantly less polished than Taylor's. Aune doesn't routinely exercise the upper limits of his range, instead choosing to hover in a mid-ranged shout, but when he reaches - such as on the intricate "Beyond The Gate" - he nails the notes with ease. Working in concert with some rousing gang choruses, the vocal aspect of Make It Dark is a solid win. Songs like the contagious "Mystera", the bass-heavy title track, and the chuggy "White Shadow" exemplify Twisted Tower Dire's take on traditional metal, delivering the noodling solos, melodic twin-guitar riffs, strong bass lines and thundering fills by the ton. "The Stone", which increases the pace just slightly from the rest of the album, has some very nice swirling riffs from guitarists Scott Waldrop and Dave Boyd, but the track that stands out the most is "Torture Torture". The anthemic vocals and infectious riffs are simply killer. There's nothing revolutionary on Make It Dark, and thank the Gods for that! The only time the band alters their formula - and it's just a slight alteration at that - is on the album's closing track "Beyond The Gate". The riffs here have a slightly more progressive sound to them, as does the pacing of the song, all of which perhaps hints at a future direction the band might be heading in. 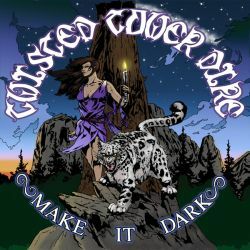 Make It Dark is a strong album from start to finish that is a must-have for any fan of traditionally styled heavy metal. A running time of less than 40 minutes may draw some complaints, but the punch packed into this album more than makes up for its brevity.